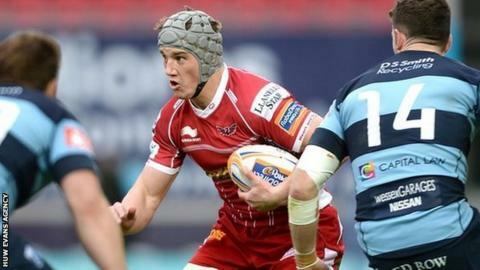 Scarlets gave Clermont Auvergne-bound Wales and British and Irish Lions star Jonathan Davies a winning Pro12 send-off against Cardiff Blues. But the game ended with a worry for Wales as home fly-half Rhys Priestland was helped off near the end. Rhodri Williams, Liam Williams and Steven Shingler went over for the hosts while the latter and Priestland kicked five goals between them. Macauley Cook went over for Blues, who also earned a penalty try. Stand-off Simon Humberstone put over a conversion and penalty as Welsh rugby's regional season drew to a close. The encounter did not affect either side's positions in the table as Scarlets ended sixth and Blues seventh in the 12-team competition. Centre Davies was not the only player saying his farewell on the night. Leigh Halfpenny, who is joining Toulon, was "gutted" to miss Blues' final game ahead of his departure. Lions full-back Halfpenny underwent shoulder surgery in March and will also miss Wales' summer tour to South Africa. Lock Bradley Davies is also leaving the visitors, for Wasps, while Scarlets back-rower Josh Turnbull is moving to Cardiff Blues. Visiting wing Harry Robinson is heading the other way while Scarlets' Fijian prop Deacon Manu will be retiring to become a club coach in Hong Kong after eight seasons as part of the Llanelli-based team. Blues number eight Robin Copeland joins Munster ahead of the 2014-15 season while wing Chris Czekaj (Colomiers) and back-rower Luke Hamilton (Agen) will join the Welsh exiles in France. With members of Wales' coaching panel members in attendance, places in the national Probables v Possibles trial on 30 May were in sharp focus. Welsh derby pride was also at stake as the hosts sought revenge for their Judgement Day defeat by Blues at Millennium Stadium on 20 April. On that occasion Scarlets full-back Liam Williams and Blues' Irish number eight Robin Copeland clashed and were each later banned for two weeks. There was no repeat at Parc y Scarlets as both teams attempted to entertain as their seasons came to a close. The hosts kicked off their effort with an outstanding try for scrum-half Rhodri Williams, who is involved in a selection battle at regional and national level with squad-mate Gareth Davies. Priestland's well-timed pass to Jake Ball allowed the Wales lock to free Wales Six Nations squad member Williams. Fly-half Priestland converted, but the visitors bounced back with a delightful try of their own, scored by flanker Cook. Wales centre contender Cory Allen flicked Gethin Jenkins' pass on to lock Filo Paulo and the Samoan international gave Cook the chance to go over in the corner. Humberstone failed with the conversion attempt, but was on target with a penalty to give his the lead until Priestland replied as half-time beckoned. Having made his mark for the wrong reasons in their last meeting, man-of-the-match Liam Williams stretched the hosts' lead as he fended off Humberstone and beat flanker Josh Navidi on his way to the line. Again Blues fought back as Wales and Lions prop Gethin Jenkins led a drive from a close-range line-out that ended with them being awarded a penalty try as Scarlets dragged it down illegally. Humberstone converted, but Shingler's long-range penalty eased the home side's worries. And after Priestland departed Shingler took advantage of his switch to the pivot's role to finish off his display in style. Scarlets: Liam Williams; Kristian Phillips, Jonathan Davies (capt), Steven Shingler, Jordan Williams; 10 Rhys Priestland, Rhodri Williams; Phil John, Ken Owens, Samson Lee, Jake Ball, Johan Snyman, Josh Turnbull, Rob McCusker, Aaron Shingler. Replacements: Kirby Myhill, Rob Evans, Rhodri Jones, Richard Kelly, Sione Timani, Gareth Davies, Olly Barkley, Gareth Maule. Cardiff Blues: Dan Fish; Alex Cuthbert, Cory Allen, Isaia Tuifua, Harry Robinson; Simon Humberstone, Lewis Jones; Gethin Jenkins, Matthew Rees (capt), Taufa'ao Filise, Bradley Davies, Filo Paulo, Macauley Cook, Robin Copeland, Josh Navidi. Replacements: Kristian Dacey, Thomas Davies, Scott Andrews, Chris Dicomidis, Ellis Jenkins, Lloyd Williams, Dafydd Hewitt, Thomas Williams.